Once practiced only by the most esteemed scholars of our society, ink painting is one of the highest forms of Chinese cultural preservation. We recommend you don’t treat this medium lightly – it takes painters decades, sometimes lifetimes, to master the qi and flow of ink on paper – but if you want a head-start, hit up Danny Liu’s studio in Mong Kok (facebook.com/dannyliuwinghung). You’ll have to prove your passion, though, as his waiting list reflects the calibre of his teaching – however, all the classical basics and then some are covered here. For modern ink painting, try the courses at Chinese University (cuhk.edu.hk), where Wucius Wong, Liu Kuo-Song and other masters have taught in the past. Serious about it? The way to really learn is as old-school as the art-form itself – seek out your favourite ‘shi fu’ and approach him or her for an apprenticeship. One of the most important foundation skills for any artist is unfortunately a rare sight in this city. However, you can always check out North Point’s Hong Kong Art Tutoring service (hkarttutoring.com), which offers courses catering for students. 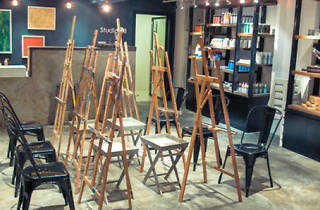 For drop-in classes, check out HKStudio (facebook.com/groups/lifedrawinghk). The intimate weekly classes here are run by artist Philippe Charmes, who selects a variety of models (sometimes in pairs) in mainly short poses to challenge the students. Like to learn more? Read as well as draw! The human anatomy is incredibly intricate, so Figure Drawing: Design and Invention by Michael Hampton is one of the best tomes around for understanding how to draw, well, us. Also, the late American illustrator Andrew Loomis has a fab series on drawing, which is available on bookdepository.com. Want more? The industrial complexes of Fo Tan and JCCAC offer regular classes in all manners of disciplines. Go online and seek more information. 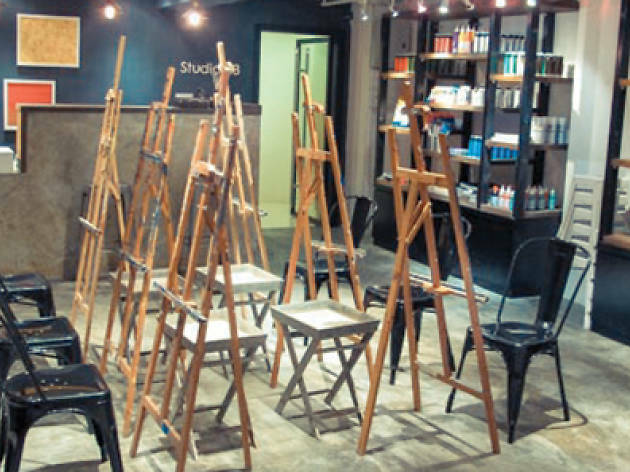 With the multitude of art stores around the city, it’s pretty easy to grab a few necessities and mess around – but, for those who prefer a gentle tutelage and a nurturing class environment, head to the bright and airy Studio 83 (studio83.com.hk). The focus here is more on classical oil or acrylic painting, and the studio also offers private classes for those who like a bit of one-on-one attention. If you’re looking for something more traditional, the Hong Kong Arts Centre (hkac.org.hk) provides a range of short-term and long-term painting classes, as well as some fun fusion courses like the ‘watercolour and Chinese ink’ programme – a blend of Western and Chinese disciplines. Where can you buy supplies? If you’d like to branch out on your own, try Artland (artland.com.hk) on the island, or Hong Kong Art Supplies Professional in Mong Kok (call 2390 0228). We’ve all swooned over that iconic Ghost scene – you know, where Patrick Swayze comes up behind Demi Moore, gives her a kiss and then puts his hands over hers as she’s shaping her clay. Granted, they don’t actually get much pottery done – but that doesn’t mean you can’t. Check out Pottery Farm (potteryfarm.com.hk), which encourages creativity in all shapes and forms from its students, or The Pottery Workshop (potteryworkshop.org), which offers not only traditional classes but also a couple of parent-and-child-orientated courses. Both are only open during class times, though, so be sure to call ahead. Want inspiration? Check out the maze of shops at PMQ (pmq.org.hk), including Flow + Living, where local artisans’ ceramics are on offer.